We are Excited to Announce that The Holme, Shield Hill, Haltwhistle is now ready for viewings. Please note all viewings are to be arranged through our Haltwhistle Office 01434 322277 and are accompanied viewings by a member of the Pennine Ways Team. Last viewing of the day will be 3:30pm due to the dark nights. 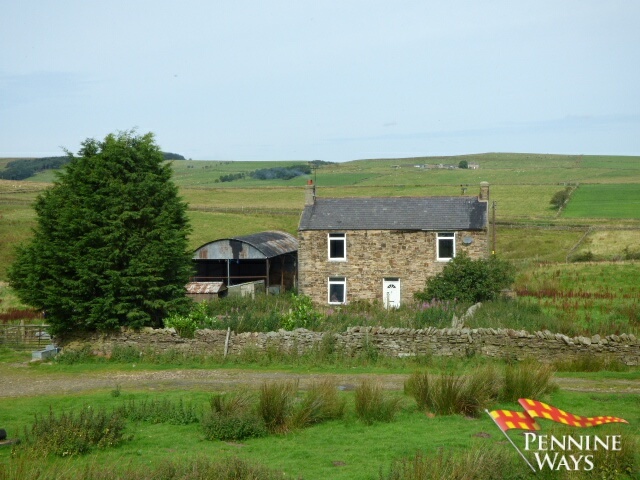 Traditional stone built farmhouse set in nearly 6 acres of ground with various outbuildings, accessed via a well maintained track from the road. Benefitting from 2 large fields bordered by fencing and dry stone walling, small wooded area and views over open countryside to Hadrian’s Wall. The house has 2 large bedrooms, 2 reception rooms and requires modernisation. Perfect for a smallholding or horses. Set at the front of the property having UPVC door to garden, stairs to first floor and doors to living room and reception room 2. Good size room having a range cooker with open fire and back boiler, airing cupboard with hot water tank, UPVC double glazed window to front aspect, picture rail, doors to under stairs cupboard, front hallway and through to the kitchen. Large room with UPVC double glazed window to front aspect, picture rail and open fireplace. Three piece suite comprising low level WC, pedestal wash hand basin, cast iron bath and window to rear. Wood floor with doors to bedrooms. Large double room, wood floor and UPVC double glazed window to front aspect. Large double room, wood floor, cupboard with shelving and UPVC double glazed window to front aspect. In addition to the house is a number of farm buildings, some constructed of stone and other of timber with a Dutch barn to the left of the house used as a hay store. To the rear of the property is a small garden with access to buildings and fields and to the front a South facing walled garden. The land extending to nearly 6 acres is set in one block around the farmhouse. The boundaries are all either solid-stone walls or fenced. Mains electricity and water. Private drainage. Telephone line installed to the property. There is a vehicular right of way to the farmhouse from the public road along the track approaching the property. Separately, there is a permissive pedestrian right of way along the boundary on the North side of the land running alongside the Haltwhistle Burn. Haltwhistle is a traditional Market town situated in the Tyne Valley near to the famous Roman Wall and Historical visitor’s centres with excellent facilities and amenities in the town and within easy access to Brampton, Carlisle and Newcastle. If you are heading east on the A69 (from Newcastle) please take the first right hand turn into Haltwhistle town, take the first right hand turn onto Shield Hill B6322 Rd and proceed up the hill for 0.5 miles going past Herding Hill Farm Campsite. Shortly after there is a track to the property on the left hand side just past a small cottage on a bend. If you are heading west on the A69 (from Carlisle) please take your second left hand turn into Haltwhistle Town shortly after the small roundabout located on the A69. Take the first right hand turn onto Shield Hill B6322 Rd and proceed up the hill for 0.5 miles going past Herding Hill Farm Campsite. Shortly after there is a track to the property on the left hand side just past a small cottage on a bend.